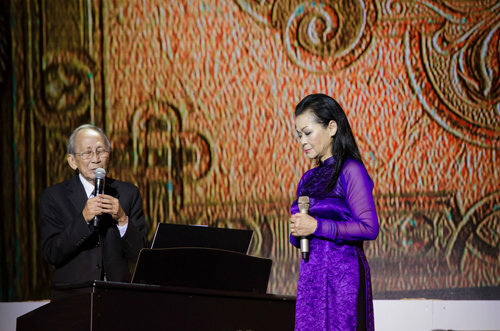 Veteran expat Vietnamese singer Khanh Ly (right) and revered local composer Nguyen Anh 9 are pictured during Ly's live show held in Hanoi on August 2, 2014. A seasoned expat Vietnamese singer will stage a live show in southern Vietnam in more than two weeks after it has been postponed for three months over a royalty fight. Khanh Ly, a beloved singer who lives in the U.S., will sing in her live show – “Khanh Ly Live Concert in Binh Duong” – on January 23. The concert will take place at the Convention and Exhibition Center, located in the heart of the New Binh Duong City, the namesake province’s new administrative center, a 1.5-hour drive from Ho Chi Minh City. At the event, the singer will be performing the songs which have made her name, including the haunting melodies composed by late revered composer Trinh Cong Son, her long-standing friend. Ly’s show will also feature some guest celebs, including composer Nguyen Anh 9, expat Vietnamese singer Elvis Phuong, and emerging singer Ha Anh Tuan. Tickets cost from VND900,000 to 2.5 million (from US$42.36 to $118) apiece. The organizer plans to offer buses to carry audience members from several places in Ho Chi Minh City’s District 1 and 3 to Binh Duong Province, and the other way round. Ly is poised to show up in Ho Chi Minh City on Sunday to get ready for the concert, according to the organizer. The date of the much-awaited music show was fixed after its postponement in October 2014. The 70-year-old singer held two live shows in Hanoi and the central city of Da Nang on August 2 and 8, 2014 respectively. Right before the Hanoi show, Vietnamese composer Pho Duc Phuong, director of the Vietnam Center for Protection of Music Copyright (VCPMC), personally went to the performing venue and demanded payments from the organizer for the right to use several songs by Trinh Cong Son in the musical event. According to Phuong, the concert organizer did not sign any contract with the center regarding the copyrights of the songs even though the VCPMC had sent a document on the issue to them 10 days before the show. A representative of the show organizer, Dong Dao Entertainment Company, admitted in early August that the company had difficulty paying for the song copyrights as tickets did not sell as well as they had expected. The issue ended with a brief meeting between the two sides only minutes before the concert began in the capital city, and Dong Dao Entertainment Company finally agreed to pay the song copyright fees. The royalty issue led to the Binh Duong show being called off. Ly began her singing career in Vietnam in 1962. Five years later, she met Trinh Cong Son, whose songs helped turn her into a legend in the local music area for many following years. Her fame remains intact during her years living abroad. Ly left Vietnam for the U.S. in 1975 when the country was reunified following the fall of the former Saigon regime. She was one of the highest-paid and most sought-after overseas Vietnamese singers and has sung in several countries. In 2012, Ly received a license from the Department of Performing Arts under the Vietnamese Ministry of Culture, Sports, and Tourism, allowing her to sing in Vietnam for the first time after nearly four decades. Trinh Cong Son was a composer, musician, and songwriter widely considered one of the three salient figures of modern Vietnamese music, along with Pham Duy and Van Cao. Son passed away in 2001 at the age of 62.